From my father’s description of his transport ship out of San Francisco and the approximate number of soldiers that were aboard, I can speculate that it was a Heywood class ship, as seen to the left. As the ship lumbered out to the ocean swells, many of the young men took their final glance of the USA. 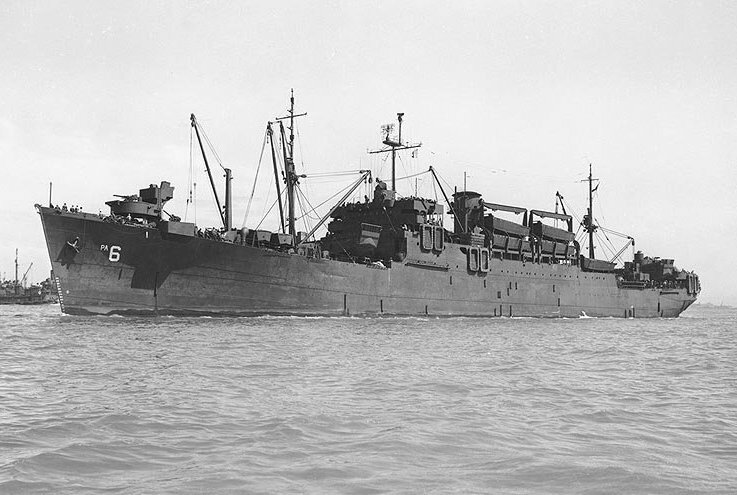 Smitty thought that his most boring time in the army was while he sailed on this cruise, although he did well in learning how to play cards – as did many other G.I.’s. As they boarded, the ship’s crew immediately began enforcing the security procedures. All portholes and hatches were covered and no lights were allowed after dusk. The heat below deck would become intolerable. The arrival of the “ditty bags” filled with toiletries, cigarettes, gum and a harmonica brightened their spirits; although many of the mouth organs were sent flying overboard when the noise made from the tin-eared soldiers became too much for the ship’s officers to endure. This cruise would take 28 days. 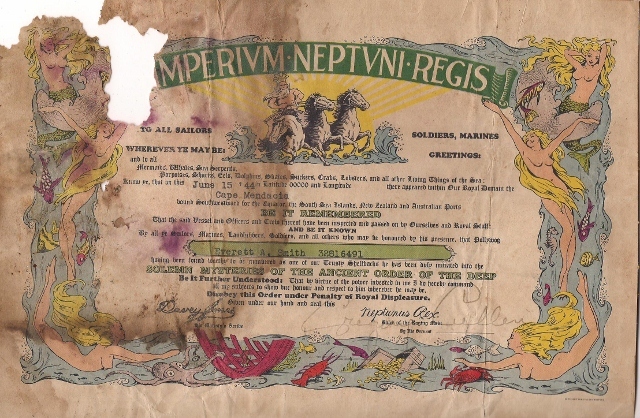 When they passed the equator, as per naval tradition, the ship’s crew donned their apparel of King Neptune and his court in preparation of handing the “Pollywogs” (the soldiers) their certificates of crossing. The Royal Barber tried to cut the hair of the crew-cut troopers and the Royal Executioner paddled a backside with an oar if the receiving line moved too closely to a snail’s pace. (which one can imagine was every G.I. derriere that went by!) Smitty was one to really enjoy this sort of tomfoolery — even if it was with the navy! The water damage you see to Smitty’s certificate (pictured below) is one of the reasons I began to make a facsimile of his scrapbook onto the computer. The more research I did, the more people I discovered who were out there, also looking for data on their own relatives, ergo – this blog. I have re-typed the contents of the certificate to show the humor involved — despite a war. Dear Mom, We have been on this tub for quite some time now and I must say that although the army doesn’t go to any great pains making you comfortable, they sure do go to extremes making it unpleasant. I can’t tell you as much as I would like to about the trip or what we are doing. One reason is that we don’t know where the heck we are anyway and as for what we are doing, well anything we might like to do would be stopped sooner than it got started. It has gotten so that now we have to play cards, if money is displayed, down in the hold. Seems as though the sea gulls over this ocean are the pious type and the sight of men gambling is revolting — or they think it is food. To try and describe the food or the mess hall would curtail the use of profanity the like of which I wouldn’t attempt to use. To call it food in the first place is flattery at its best. Mess Hall is very appropriate — it is some MESS. This is the first time in my life that I can truthfully say I dread the thought of eating. We are supposed to tell you that on board ship we can purchase cigarettes for 4 1/2 cents a pack, also candy and a load of other stuff at cost price. We can also buy bottles of coca cola, but the blame stuff is so hot that we are of the opinion that loaded down with this coke in our stomachs, we might be used as depth charges if a sub should show up. We did receive free, with no strings attached, a bag full of necessary things from the Red Cross. It really was worthwhile going after. Dear Mom, Well, here I am again as promised. Yesterday we had a little something different to sea besides the sea. Notice that I’m getting so that I can only spell the sea when I mean to write see. Early in the morning we had the pleasure of seeing another ship and must say it sure made one feel good. Why it should though I can’t say unless it is the thought that someone else is having it just as tough. Guess there is some truth in the saying, “Misery loves company.” We also had the pleasure of watching some islands in the far off distance. I won’t try to describe them to you, as that would be too much to expect to pass. (Censorship) You will kindly take notice that I used the words “pleasant” and “pleasure,” if I keep that up you might get the idea this is getting to be that kind of voyage. Some amusing things do happen though, such as the boys sleeping out on the deck getting caught in the rain or some clumsy ox slipping and sliding his way along the boat. By the way, I forgot to tell you that we get the regular news everyday in a printed form resembling a newspaper. Also music by record sounds tinny, but anything out here is good. Dear Mom, I was seriously thinking of tearing this letter up, as I couldn’t for the life of me locate an airmail stamp aboard ship. I kept at it though until finally fortune smiled down on me and success was mine. I have been pretty lucky so far at my card playing activities and should it hold out until we reach some civilized port, why I’ll be ahead and you will be pleasantly surprised when you receive my check for like amount. We can cable home money from abroad so might just as well take your advice — surprised? — and send it home for that day when we shall all return. We have a large map of the world hanging up on the wall, which supplies us with as much amusement trying to figure out just where we are. According to figures, dates, times and patience, we should be hitting a port sometime real soon. In fact there is a rumor being whispered about that we will hit one tomorrow. Now this rumor comes from good authority seeing that it came from a fellow whose first sergeant is a second cousin to the uncle of the father of the first mate whose brother is third cook on this boat. Now, can’t you see why we are so glumly overjoyed? All kidding aside though, we should be nearing one soon. 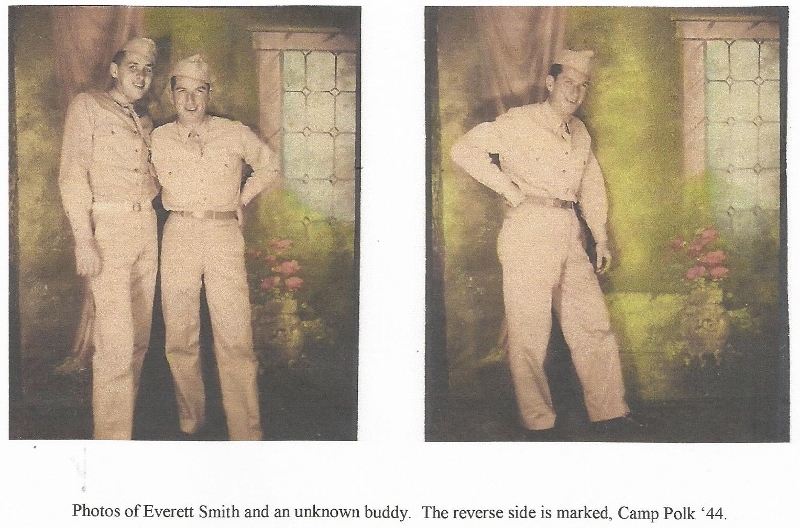 Posted on October 14, 2012, in Letters home, SMITTY, Uncategorized, WWII and tagged 11th A/B, family history, Gregory Cullen, History, Pacific War, paratroopers, transport ship, trusty shellback, war letters, WWII. Bookmark the permalink. 8 Comments. I was a bit surprised when he mentions trying to locate a n air mail stamp. I thought service people (especially those headed to or in war zones) had franking privileges. It must have begun later on in the war. I’ve seen examples of franked mail in the collection at a military museum I volunteer at in my hometown. This was on board ship, would that have made a difference? BTW, I take it Andy and Dougie took a long nap this morning – it looks like you spent quite a bit of time reading most of previous posts, like this one!! How can I ever than you? So many people just pick up on the latest. It’s nice to know that someone else will remember!! Your father really had a great sense of humor, which was probably instrumental in his survival of the war. Really enjoyed the ceremony for passing the equator! Yes, he did indeed have a great sense of humor. The Neptune ceremony is all in good fun and helps their morale. I see that!! Word press says the file isn’t available – what the heck is going on? Now this rumor comes from good authority seeing that it came from a fellow whose first sergeant is a second cousin to the uncle of the father of the first mate whose brother is third cook on this boat. Such a great example of the service! I have laughed at that letter since I was a child.